The church, which has been named St. Michael’s, ‘clearly brings a lot of comfort to many of the Christians’, said Songs of Praise presenter, Sally Magnusson. 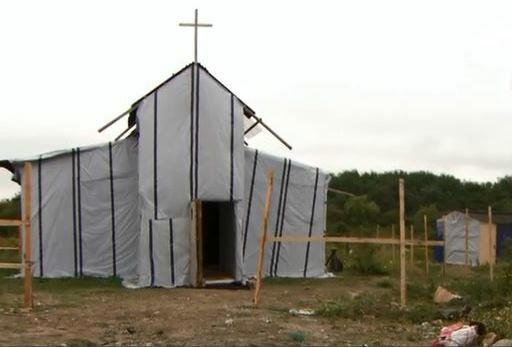 A “contentious” church built in the midst of a makeshift refugee camp in northern France was featured on the BBC’s flagship Christian worship programme, Songs of Praise, on Sunday (16 August). 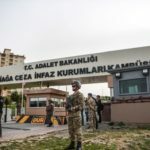 The episode, available in the UK for 30 days on the BBC’s iPlayer, focuses on the “faith aspect” of Europe’s so-called “migrant crisis”, which so far this year has seen 200,000 migrants land on European shores. Around 3,000 of those migrants are currently living in a refugee camp (nicknamed “the jungle”) on the outskirts of the French port town of Calais, from where they hope to travel to the UK. The majority of the camp’s inhabitants are Muslims, explains presenter Sally Magnusson, but there are also “significant” numbers of Christians from countries such as Eritrea, Ethiopia, Sudan and Syria. “Amidst the canvas and corrugated iron, they’ve clung to the thing most precious to them – their faith,” Magnusson explains. One Sudanese Christian, named Daniel, says he left his homeland because he was persecuted for his faith. “I’m Protestant but it’s not accepted in my country,” he said. Several Christian volunteers are also interviewed, including Maya Konforti from L’Auberge des Migrants, who helped to build the church, which has been named St. Michael’s. Konforti referred to the Christian migrants’ faith as “gigantic”. “The first thing they wanted to do was to build a church. They wanted a church before they even wanted a home,” she said. French volunteer Pierre Gobled from Secours Catholique said he wanted to help “human beings who have lived through difficult times” to live with “dignity”. “I’ve had faith since my childhood. I live in good conditions, so I feel I should put this into practice and come to help [these] destitute people, people who live through difficult moments in their life,” he said. Susan Pardo, a British volunteer, said she was “very sad” that some disagree with helping the migrants. On 17 August, World Watch Monitor published the story of an Eritrean pastor who fled his homeland 15 years ago and never returned. His journey to the UK took four years. You can read about it via the link below.